R.D. ELECTRIC WORKS Established in 1990. It Is one of the leading Manufacturers of Power Conditioning Products in the Industry. Under the brand name SERVOLINK. Being an ISO 9001:2008, certified company, our product is manufactured as per ISO Standards. 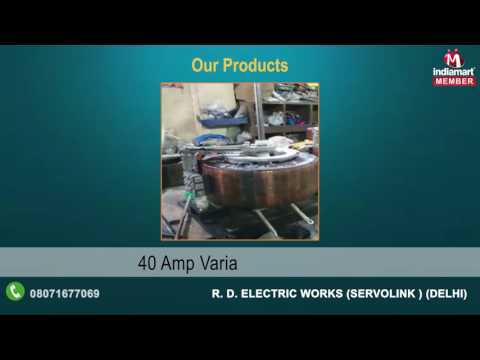 Today with more than a decade of experience in the manufacturing of Power Conditioning Products, R.D ELECTRIC WORKS has grown up in geographical range to become one of most Trusted Name in the leading Quality manufactures in of wide range : Servo Voltage Stabilizers, Domestic Voltage Stabilizer, Industrial Voltage Stabilizer, Automatic variable transformer (Dimmer), Isolation & ultra Transformer, Constant Voltage Stabilizer, A.C Stabilizer, Torodial Transformer., Online UPS . Designed & manufactured by highly trained engineers.